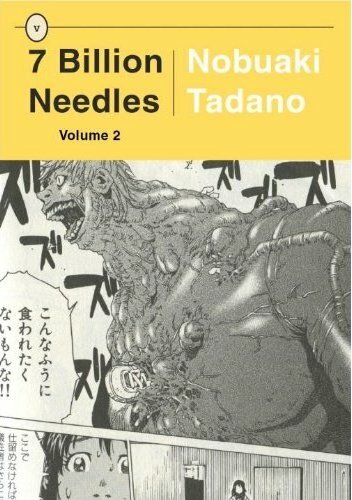 The last time I wrote about 7 Billion Needles (Vertical), Nobuaki Tadano’s manga homage to Hal Clement’s Needle, I neglected to mention the retro cover design, which is terrific. You know that smell that used paperback stores have? The look of the book evokes that smell, and the proportions of the book support it. The contents of the book don’t quite evoke that pulpy nostalgia, but they hint at it, and they’ve got their own charms. In the second volume, Tadano inches forward with his meta approach to the tale of two warring aliens who crash on Earth and proceed to mess up the life of an isolated high-school girl and threaten the people around her. If Ultimo (Viz) is kind of a bland, accidentally creepy look at the endless battle between good and evil, 7 Billion Needles seems intent to play with the construct in ways that are perversely endearing. These moments aren’t the meat of the book, but they are the spice, and they’re welcome. They enliven what might otherwise be a standard, well-executed bit of violent angst. And it is well-executed, even without the twists on the formula. This time around, Hikaru confronts a trauma from her past. With the encouragement of her new friends, she goes to the village where she spent her childhood and confronts the reason she’s shut herself off from the people around her. Of course, the ostensibly heroic entity sharing her body and the monstrous being they battle complicate the sentimental journey with plenty of menacing action. This series really is a pleasant surprise. Of the four series Vertical has debuted this year, my expectations were probably lowest for 7 Billion Needles, but it’s smarter and more interesting than I had anticipated. Go read Kate (The Manga Critic) Dacey’s review for a thoughtful take on the book. There’s also the debut of Kakifly’s K-On (Yen Press), a well-liked four-panel comedy about a high-school music club. It originally ran in Houbunsha’s Manga Time Kiara Carat. You are currently browsing the The Manga Curmudgeon blog archives for the day Tuesday, November 23rd, 2010.